Save yourself unnecessary headaches and purchase an authentic BenQ HT1075 projector lamp. Avoid counterfeit lamps. You’ll need model BenQ 5J.J9H05.001 replacement lamp. Why go authentic? Counterfeit “compatible” lamps may appear to be a bargain but in the long run end up costing more due to their shorter lamp life. They are prone to explosions and can put your eyesight at risk. Due to their substitute toxic materials and carcinogenic parts, the few dollars you will save are not worth it. Protect your health and keep your BenQ HT1075 working at optimum levels. Go with an authentic projector lamp. Your BenQ HT1075 projector uses the BenQ 5J.J9H05.001 replacement projector lamp. 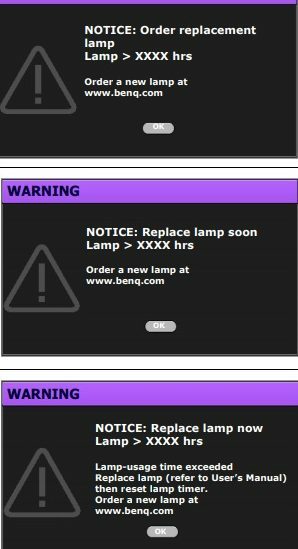 When it’s time to replace the BenQ HT1075 projector lamp you’ll see a series warnings appear on screen. projector until the next hour lamp warning appears. Press OK to dismiss the message. Final warning: The lamp MUST be replaced before the projector will operate normally. 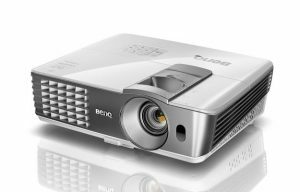 Reduce the risk of electrical shock by disconnecting the power cord on the BenQ HT1075 projector. 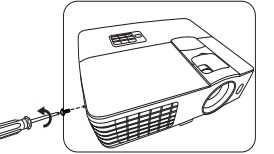 Reduce the risk of severe burns by allowing the projector to cool for at least 45 minutes. The projector should be cool to the touch. 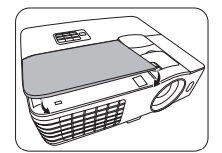 The projector lamp cover is found on the side of the BenQ HT1075 projector. Lift up the projector lamp cover. Put it to one side. 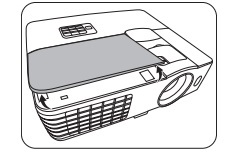 NOTE: The BenQ 5J.J9H05.001 projector lamp contains mercury and should not be thrown into regular garbage. It should be properly recycled. Loosen the screws that secures the lamp. Lift the handle so that it stands up. Use the handle to slowly pull the lamp out of the projector. 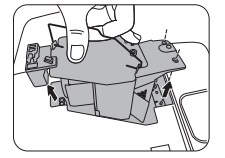 Pulling it too quickly may cause the lamp to break and scatter broken glass in the projector. 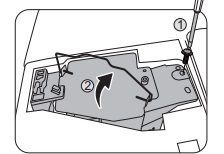 Insert the new BenQ 5J.J9H05.001 lamp into the projector taking care not to touch the actual bulb. Tighten the screws on the new lamp Loose screw may cause a bad connection, which could result in malfunction. Do not over tighten the screw. 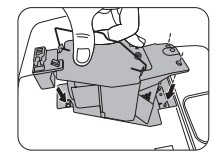 Replace the lamp cover on the BenQ HT1075 projector. You are know ready to reset the lamp timer. After changing the lamp, you’ll need to rese the lamp timer. Do not reset if the lamp is not new or replaced as this could cause damage. After the startup logo displays, resetting the lamp timer via the OSD menu. If there are signals connected, go to Settings > Reset Lamp Timer and select Reset. I installed a new lamp on my pro350 optima projector. When I turn on the light goes green and immediately turns red: no light from lamp. How am I suppose to reset lamp timer if no light to see projection? 1. The lamp was not installed properly. Try taking it out an re-installing making sure all the connections are secure and that the lamp screws are not too tight. 2. The lamp maybe a counterfeit that wasn’t properly calibrated to the projector’s optics so the projector can’t read it. Where did you buy the lamp? Was it from an OEM manufacturer? I would contact them and ask for a new lamp or a refund.